Did You Know These 5 Fun Facts About Kittens? Five fun and interesting facts about kittens you may not have known! 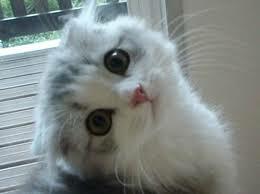 There are some things we all know about kittens: they are adorable, they are cuddly, and they are playful and curious. So let’s look at some things you may not have known about kittens with these five fun facts. Though kittens are born with their eyes shut and do not open them for approximately nine days, all kittens have blue eyes. This is because the pigments that create eye color have not developed yet. It takes two-three months for cats to develop their permanent eye color. Some cats, however, especially Siamese, retain their blue eyes into adulthood. Also, kittens have extremely poor eyesight until they are about three weeks old, after that it continues to gradually improve as they grow. How many babies can one cat have? A litter (or kindle if you want to be proper!) of kittens generally has one to nine kittens. The number can be influenced by different factors, including the age of the mother. 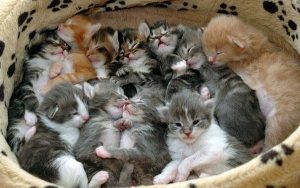 Of course, variations always occur, and some litters may only have one kitten, while the largest recorded litter had 19. You may notice that your kitten’s heart beats very quickly. Don’t be alarmed. Unlike adult humans, who have a normal resting heart rate of about 60-100 beats per minute, felines in general have a higher heart rate. The normal range for the heart rate of an adult cat is 140-220 beats per minute, while kittens have a very fast normal heart rate of 200-260 beats per minute. Kittens begin to grow tiny and sharp teeth when they are about three to six weeks old. These are their deciduous teeth, and by about six weeks all the deciduous teeth are present. 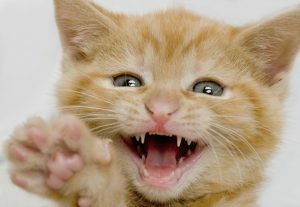 Kittens have 26 of these “baby” teeth, while adult cats have 30 permanent teeth. At about 3 months of age, a kitten’s deciduous teeth begin to fall out as the permanent teeth come in. By about six-seven months old, a kitten usually has all of its permanent teeth in place.